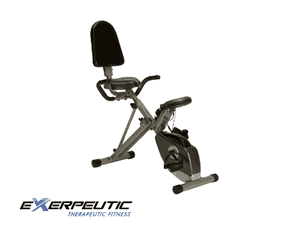 If you are looking forward to owning a recumbent bike with great features but have a very tight budget, then Exerpeutic 400XL Folding Recumbent Exercise Bike will suffice. This is considered to be a top rated and best-selling equipment even though it is still very affordable. Or maybe that is the reason why it is the best-selling because of its great features and affordability. As a matter of fact, another similar product that I would recommend is the Sunny Health and Fitness Pink Magnetic Recumbent Bike, and you can read the review here. 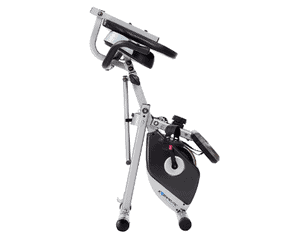 The Exerpeutic 400XL Folding Recumbent Exercise Bike is actually referred to as Semi-recumbent because of the fact that it has a little bit features of the recumbent and upright bike. And this is good for people that don’t have enough space at their homes or they simply don’t want space to be taken. I personally love its portability because I love something I can use that would be handy. I said handy because this machine is much of equipment you can bring out and use and put away quickly when you are done due to its ability to fold. It V-belt double-drive transmission system and precision-balanced flywheel also ensure quiet and smooth ride during a workout, while its magnetic tension can be adjusted up 8 levels to ensure that you have a challenging workout that will guarantee a great result. Whereas it supports 300 pounds weight of a user maximum. If you are wondering where to get it at an affordable price then head over to Amazon. Adjustability-This machine can literally fit anyone of any size because of its ability to be adjusted. It is officially stated that it will be suitable for people with height at about 5 ft 2 inches to 6 ft 2 inches tall. This means people with height range as stated above won’t complain of discomfort while using this machine so the issue of not suitable has been solved. But if you think you have longer legs but slightly below 5 ft 2 inches tall then you should be able to ride the bike, user experience has proven so. And the adjustment can easily be done and quick as well. This is usually done by loosening the knob that is beneath the seat bar and adjusts as it pleases you by putting the knob pin in the right hole you wish to use. Resistance– The resistance can be set by simply using the knob that is on the console. On top of the knob, you will see the levels written on it from 1 to 8. This controls the magnetic pad that ensures the increase and decrease in resistance. And the marked level on the knob will allow you to know which level you are comfortable with and when you progress to another level you will easily know because the resistance levels are indicated on the resistance knob. 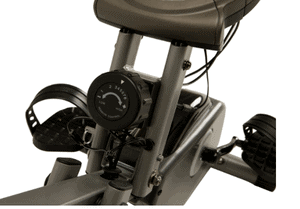 As you may know, recumbent bikes are mostly used to enable people with an injury especially knee injury and heart issues to recover; this must be used under the Doctor’s advice. Therefore, the knob with the indicated levels on it will be of great help in monitoring the progress of a patient and of those who wish to improve their overall health. Drive– The V-belt double-drive transmission system and precision-balanced flywheel guarantee a smooth and quiet ride. For ensuring that one’s finger or leg does not get caught up in it a casing is made to cover it. Pedals– The pedals are away from you so that there is no hurting effect on your knees. It also has a strap that would ensure that slippage does not occur during a workout. Not only does it have a strap but also a rough surface that would be suitable for workout shoes. 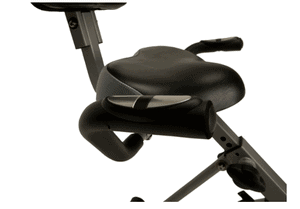 Seat– As with most recumbent bike seat, the Exerpeutic 400XL Folding Recumbent Exercise Bike’s seat was designed such that it will offer comfort to the user. It is padded with good foam and cover, the back support is also great to lean on. The back support is mostly used by users because they found it most comfortable therefore always lean on it while cycling. So, the seat offers comfort as opposed to the seat of the upright bike that users complain about. However, if you think you are not comfortable with the seat you can try an oversized gel seat cover, foam or towel on the seat in order to increase comfortability. Handlebars– The handlebars are well covered/coated for comfortable and firm grip. The heart rate sensor is also embedded in these handlebars which enable the console to read your pulse data and progress while working out. Noise– It V-belt double-drive transmission system and precision-balanced flywheel ensure a quiet and a smooth ride. You have to worry about disturbing the neighbors or even your family while exercising. Storage– This unit is about 39 pounds weight and very portable that you can literally drag it to anywhere you like. OK, that may not be quite true but it is a portable machine that moving it around won’t be much of a problem. Plus the fact it can be easily folded into the half with dimensions of 20 L x 17 W x 54 H inches and has transportation wheels so that you can conveniently store and put away without much hassle. Stable– Its stability is well established because of the stabilizer bars at the front and rear bases. These ensure that the unit does not wobble even in the event of high intensity and vigorous workouts. First, it is not suitable for serious athletes because it lacks the functionality as I am going to name them below. It is too small for taller individuals of 5 ft 10 inches and above even though it has being specified by the manufacturer that 5 ft 2’’ to 6 ft 2’’ persons can use it. But that is not the case because some users with that kind of heights have complained of their knees. The console does not have pre-programmed workouts on it. And like I said earlier, there have been complaints about customer service, either by not being polite or by putting them on hold each time they have a complaint to lodge, which unfortunately frustrates them from getting the help or replacement that they need. The warranty is limited which means some malfunctions may not be covered under it. From the review, the Experpeutic 400XL Folding Recumbent Exercise Bike has its advantages and also its fair share of disadvantages. However, the majority of the users’ reviews have given thumbs up to this unit despite its downsides. And I get it, because the price is good and what you are getting in return is only fair if not better. Just do remember to let your doctor know you are about to purchase this unit in case you have any medical history. If by any chance you need something more advanced (high-end recumbent bike) you may look up the Schwinn 270 Recumbent Bike review or something similar to Exerpeutic 400XL Folding Recumbent Exercise Bike then look up the Sunny Health and Fitness Pink Magnetic Review. Hey there! Thanks for the info, I’m not that big on exercise machines (mostly because I can’t fit any of them in my rented house LOL!) but I know a couple of people who are and I’ll definitely recommend your site to them. Fortunately some of the people I know aren’t like 6 feet tall or anything, so I think they’ll like this especially if the price is affordable lol! It is most suitable for people in this height range, 5 ft 2′ to 6 ft 2′, and the price is great too. This bike sounded great to start with. You mentioned that it is suited for people between 5’2″ and 6’2″, but then you said that people over 5’10” complained about it. That is a shame cos I am 6′ and my wife is a few inches shorter. Apart from that it’s perfect for us. As I am only two inches over that do you think I should still go for it? Maybe I could get a refund if I do have problems with it. Hello Owain, going by the official height recommendation by the manufacturer it will be perfect for you, however, like I said some people about that height range still complained of it hurting them on the knees because it appears to be too small for them. But then, this has to do with the individual difference, therefore it might best suit you, and there is no way to find out except you take a ride on it. We range in height from 5’2 through to 6’6″ (my husband) hence just how important it is to get it right! We will be the healthiest family in the UK – looking forward to giving it a go and following your easy to use link to make a future purchase. Very Impressed and thank you. Thank you very much June,I am most grateful that the review really helped you to make a decision on buying the Sunny Health and Fitness Pink Magnetic Recumbent Bike. Like I said, I believe women have a thing with pink and would surely want to own one of these units. I wish you the best of health as you make your purchase and start getting in shape.